CEA Tech is the CEA’s (the French Atomic Energy and Alternative Energy Commission) technology research unit. 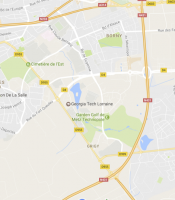 CEA Tech has opened a branch office in the Grand Est region, located in Metz, next to Georgia Tech Lorraine. The regional offices are intended to play a key role in France’s strategy to boost industrial competitiveness through high added value and enhanced product quality. Their mission is to develop local research programs that round out existing programs and that meet the unique needs of locally-anchored industries. The UMI is currently working on CEA Tech funded projects in the development of microdisplays and energy efficient LEDs.